I am sure you are familiar with the saying, “Done is Better Than Perfect”. It is my understanding that this phrase originated at the Facebook corporate offices. 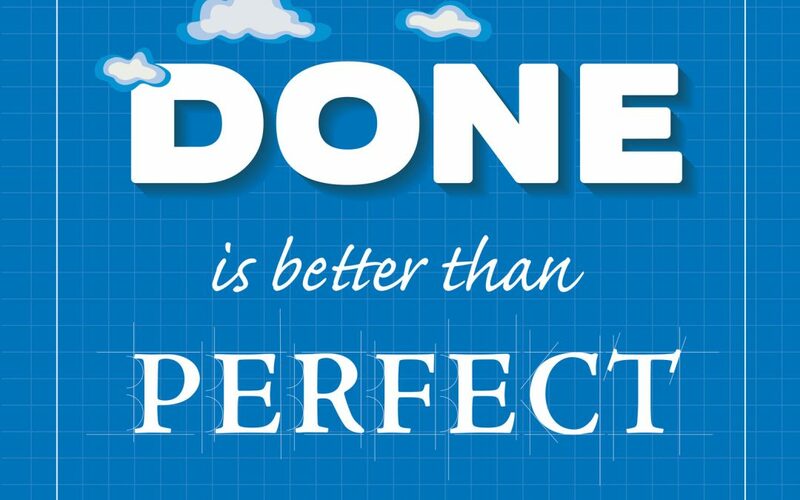 I must admit that “Done is Better Than Perfect” is something that I wish I had subscribed to in my 35+ years of operating businesses. Trying to be “perfect” seems to have been my Achilles heel for as long as I can remember. My sense is that part of this “being perfect” thing stems from our educational system. We are pushed to excel at every level of our educational process until we reach a level of perfection. In my experience coaching many traders it is very apparent that “being perfect” is not something we can easily dismiss from our DNA. The more analytical the trader, the greater challenge he or she has in “trying to figure it out”. My trading methodology is “Probability Based Trading”. Probability based trading is 100% reliant of the fact that given a statistically significant sample size the math does not lie. If you flip a coin 5 times it would be possible to have 5 straight heads. However, flip the coin 1000 times and of course the outcome will be very close to the expected results of 500 heads and 500 tails. Simply stated the law of large numbers prevails. Precisely the same thing occurs in probability based trading. The math never lies! Our relentless drive to perfection leads the majority of traders to always try to “figure it out” and/or search for the mythical “Holy Grail”. That relentless pursuit of that perfection, while admired by many, does not serve any purpose in the world of probabilities and specifically probability based trading. Here is a very simple question for your consideration and one that illustrates my point. Do you believe that if you studied 24/7 and used every possible indicator or algorithm at your disposal, you could affect the outcome of a coin flip? Of course not and that is precisely my point! Think about this. Let’s assume you have used all the previously mentioned tools to predict the next flip of the coin. If you choose “heads” and it comes up “tails” are you going to unmercifully beat yourself up? I should hope not. But this is precisely what we do as traders. We experience losing trades and we think it is all about us. If you trade according to the probabilities that are right in front of you on the option chain and you execute enough trades to make a statistically significant sample size you can predict your winning percentage. It really is that simple. I would argue that technical analysis and fundamental analysis can only show what has happened in the past. I understand if you think something as uniquely simple as using known probabilities is counter intuitive. I did too. I spent the better part of ten years trying to use technical analysis, fundamental analysis, candlesticks and every indicator I could find in an attempt to “figure it out”. To that end, I used to spend an inordinate amount of time to find trades. Then I would check and cross-check the trades before entry and still my performance results were mediocre. I now use the simple probabilities at my disposal to find and execute trades in 30 seconds or less. My winning percentage is predictable. I choose to execute trades that have a winning percentage in the 70% probability range and my results meet or exceed that target. Instead of trying to “figure it out” my trading edge is selling volatility when volatility is extended. I couple that edge with my odds based methodology. I am confident of what my winning percentage will be and my results confirm that. If I can be of any assistance or answer any questions, please don’t hesitate to call me. I love talking to other traders. Call: 239.272.3424 I answer my own phone.